Restricted Advice has been popular with some networks and large firms but it has not been widely adopted by smaller directly authorised firms. However, firms that have elected to restrict their scope of advice have subsequently found this to be the best way of providing their services. Most of the regulation is the same as operating independently, but the key differences can help a firm adopt a specific business model. That model could be a core investment proposition from the leading providers, or a small panel based on a selection of providers. 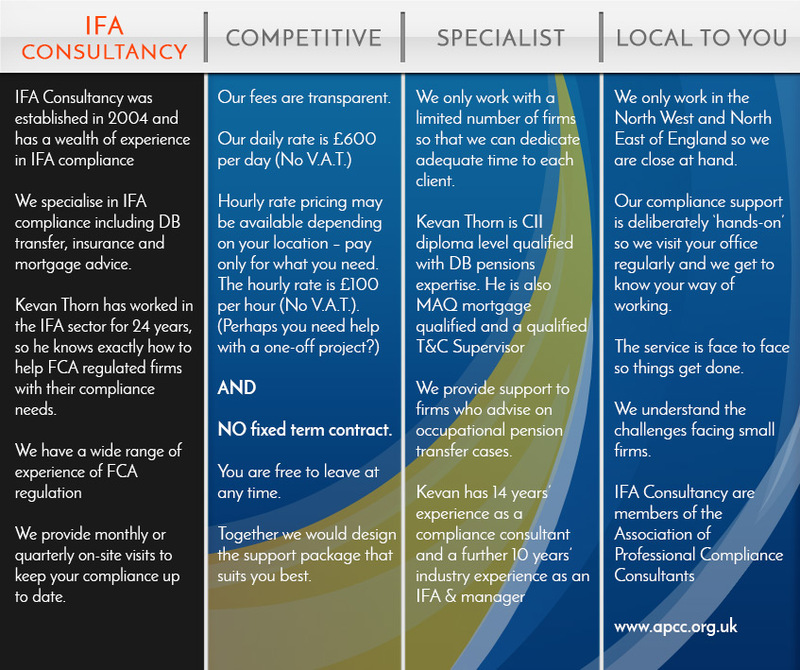 IFA Consultancy can help with the compliance needs of firms who are Restricted or who are considering adopting Restricted Advice. There are independent financial advisers who only recommend a few products from a few providers yet have the additional compliance burden of maintaining their independent status; you may be in that position and considering restricted advice as an alternative business model. We can help with the full range of FCA Compliance for Restricted Advice firms. As part of the initial visit to your office we will work together to assess your needs and then we would provide you with a 6-month compliance support plan. If there are urgent development points then we would prioritise those. At the first visit we will identify the items that we will take responsibility for leaving you with more time for your core activity of advising clients.